The Half-Life 2 ARG was a series of tests created by Valve in 2004 to promote the upcoming release of Half-Life 2. It was conducted through the game's official website, Steam, and an actual visit to the company's headquarters. The ARG began on June 23, 2004 when a Halflife2.net (now known as ValveTime) user, Merc, traveled to Valve's offices to playtest an early build of Half-Life 2. He returned to the community with photos from the tour including an image of a whiteboard with peculiar writing on it seemingly related to the game. Another forum user, Lanthanide, found an encrypted message encoded in ROT13 in the whiteboard's writing. The decrypted message was the URL half-life2.com/secret/pwn3d. When entered, the website asked for a username and password. It was later discovered that the whiteboard photo was incomplete due to part of it being cut off in the original picture, leaving the test unsolvable. When the company was contacted, Valve's Erik Johnson revealed the access details for the page: "Username: valve" and "Password: 437N452". This opened a page with a picture of the G-Man and a congratulatory message stating "Hello halflife2.net. Your cleverness is noted; you've passed the first test." The source code for the page included the keywords "congratulations, cleverness, illicit, snapshots" along with ASCII art images of Gordon Freeman and a bird identified as a robin originating from an ASCII art collection created by ASCII artist Joan Stark. This bird had previously been posted by Valve designer Greg Coomer on the Halflife2.net forums. On August 28, 2004, another Halflife2.net user, Calhoun, discovered a short text message hidden inside a picture of the G-Man (materials/models/gman/gman.jpg) located in the game file package base source shared materials.gcf, available at the time as part of the initial Half-Life 2 preload and the public Counter-Strike: Source beta. The message was "password is nova/prospekt this is the second test". These access details did not work on the page for the first test. On August 31, 2004, the community discovered a hidden link in the media section of Half-Life 2's official website. Instead of a zoom icon on the thumbnail, the sixth screenshot changed to a picture of the G-Man named "GMANSECONDTEST.gif" when highlighted. When clicked, it opened the URL half-life2.com/secret/secondtest/entry.php. This page asked for a username and a password, the earlier discovered "nova" and "prospekt" phrases working here. This took users to a black page with a text input box in the middle. The source code for the page had an ASCII art image of Alyx Vance, the same bird that had been included before, and the incomplete URL /secret/secondtest/whatsmyname.jpg, a hint to solve the puzzle. When viewed, the "whatsmyname.jpg" image was found to depict a Barnacle in Half-Life. 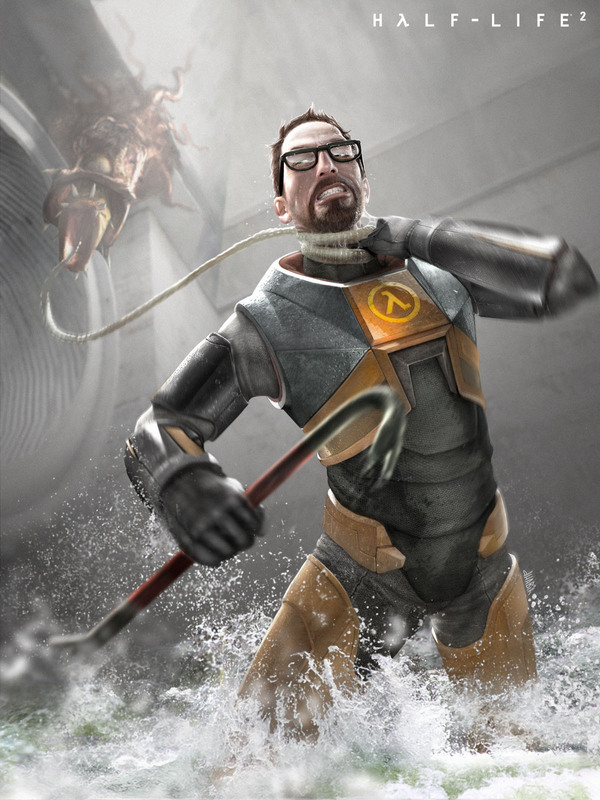 Entering the word "Barnacle" in the page's input box revealed Half-Life 2 artwork of the creature attacking Gordon in the canals. 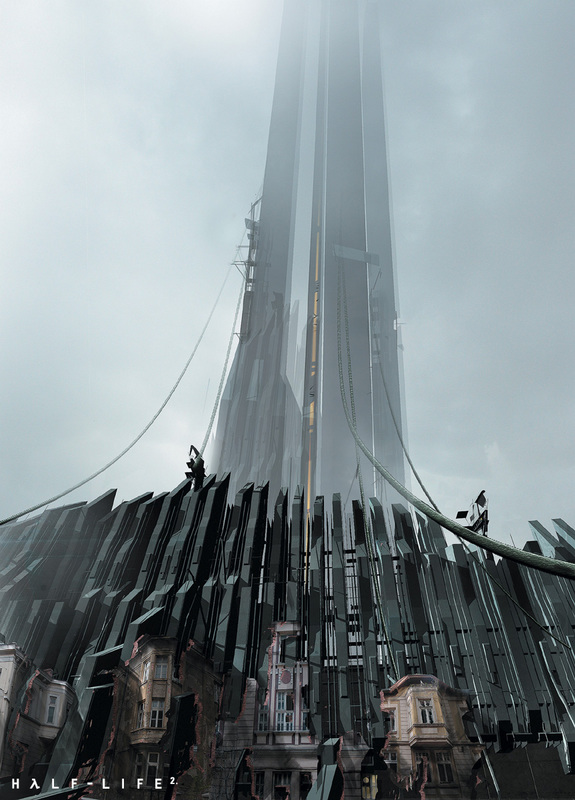 On June 18, Erik Johnson posted concept art of the Citadel on halflifesource.com. 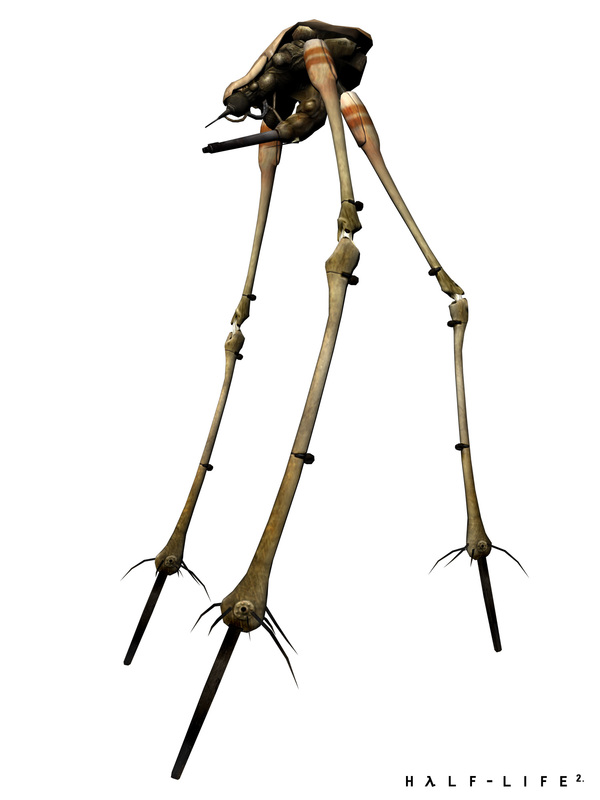 On June 19, Greg Coomer posted a model render of a Strider in response to a thread on Halflife2.net discussing why Half-Life 2 would be better than other first person shooter titles. On August 5, Coomer also posted a thread on Halflife2.net linking to a hidden page that contained three new screenshots from the game. The source code for this page included the familiar ASCII art bird as well as a new image of the G-Man. On September 23, 2004, the page half-life2.com/hl2.php was discovered by the community. This page was home to a short text adventure game based on Half-Life 2 called "Half-Life 2: PHP". This was confirmed by Valve's Chris Bokitch to not be related to the previous tests. The photo of the whiteboard at Valve's offices. ASCII art of a bird present in all three pages. The secret G-Man image containing the access details. The media section on the official Half-Life 2 website. The sixth thumbnail highlighted, revealing an image of the G-Man. ASCII art of the G-Man.